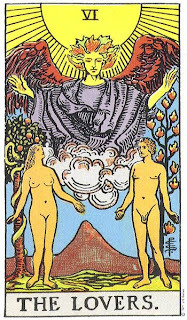 These are two of the most enigmatic cards in the entire tarot deck and when seen together, there is a purposeful similarity between the two. You could almost take them as a photograph and a negative. There are some fascinating discussions that have already gone on in other areas (check out Aeclectic Tarot's discussion board for instance) about the parallels. There are many interpretations of these cards and, depending on how they come up they can mean a great many different things. When seen together there is important insight in their reflective similarity and their polarity to one another. In much of my work I see these two symbols as the motivations in human relationships. The Lovers being the transformational side of love that "lifts us up where we belong", and the Devil being the obsessional, fear based side. More simply put, I often refer to them together as "attraction and distraction". A healthy relationship (not just romantically but on so many levels) helps us discover there is so much more to ourselves and we want to share that. A fear based relationship is where we are desperately seeking in another and avoiding our selves at the same time. I notice a lot of people (and at times I've been in this state myself) that aren't so much afraid of being alone but don't want to be stuck with themselves. Seeking fulfilment in another while avoiding ourselves is a dangerous trap. We tend to focus on the most distracting person in the room and, chances are if they respond, they are in the same state themselves. This isn't sharing, this is dangerous role-playing where our fears and insecurities are getting the best of us. Learning the difference between these motivations is part of everyone's life journey and it doesn't just manifest romantically. We can choose situations where there is a motivation of growth or a motivation of fear. Sometimes when the devil card comes up in a reading it is time for these things to be faced and confronted. To see where fear has been manipulating us and to release that. Although it is not a pretty card, it is a necessary symbol of what has not been good for us being brought to light. We can be free of it and this is often a first step. I liken it a lot to discovering our allergies. 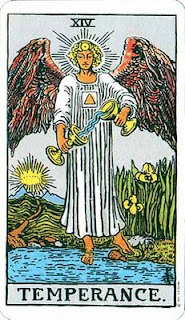 There is a card that stands between these two that is part of that sorting out: Temperance is where we slow down and look at what is behind our instinctive drives and see where they have gone off-course. Some say that all instinct has a divine source but we often get misdirected in it's fulfillment. 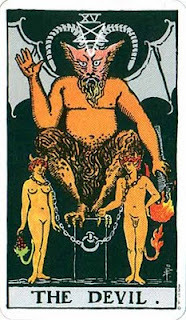 If the devil card is about temptation ruled by fear, temperance is the ability to see the healthy side of instinct and to move it towards the liberating quality of the Lovers. 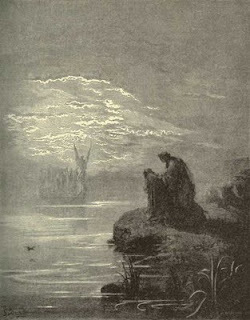 The poet Dante in his "Divine Comedy", wrote of a gaurdian angel (Virgil) that watches over him as he seeks through hell, purgatory and finally paradise. I believe this is the higher awareness that is working with us as me move through our fears toward freedom. Sometimes it helps to make an association when describing a court card. I will often use analogies to famous people or stories in giving a description of someone in a reading. I should mention too, that I don't always necessarily pay attention to physical reversals of a card. In other words it's not necessarily that the card itself is reversed, it's more whether the energy of it feels "stuck" or muted. When a Knight is reversed energetically it's like the quest has become misdirected, the person is forever seeking and not allowing for real fulfillment, or in some instances the struggle of the reversal is an indication of a strength not yet mastered (particularly with those younger). Either way there is a lesson in getting unstuck. In some instances it may be a conscious or unconscious resistance to the learning. A person continually questing for answers, but resisting them when offered would also fit with this. I often find that the reversal or stuck aspect of an element is where a genuine ability or strength has come to be misused. For cups it is like the helping aspect has gotten out of hand and become smothering or, in a sort of self delusion, the sort of giving to get mode. Pentacles reversed would be strategic thinking turned into manipulation or a distortion of values. Reversals are like the gift turned into addiction and are part of what we have to work through. The Knight of Wands in this reversed mode is a lot like the Eagle's song "Desperado" - "out ridin' fences for so long now". There are card references (curiously enough) in the song too; "Don't you draw the queen of diamonds (pentacles) boy, she'll beat you if she's able, the queen of hearts (cups) is always your best bet. It seems to me some fine things have been laid upon your table, but you only want the things that you can't get". 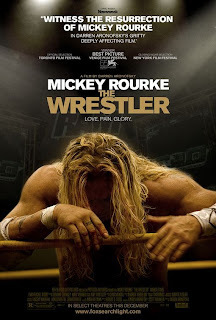 If you've seen the movie, "The Wrestler" with Mickey Rourke, it's a classic expression of what happens when the Knight's pursuit of challenge has gone on in one mode too long, to the exclusion of all else. Ever notice that certain numbers figure in folktales? When you're telling a story to a little kid there's usually three things that happen, this forms a pattern. There's usually three wishes for example, or three lessons. It's standard practice to give three examples before using an "etcetera" i.e. ; "you're fired because you are not a good fit for this company; i.e. your tardiness, poor communication skills, you botched the report, etc.". Threes are where we see a pattern set in motion or in evidence. Sevens are also a sort of "magic" number. They show up in stories, religion and mythology, for instance there are seven vices and seven virtues. 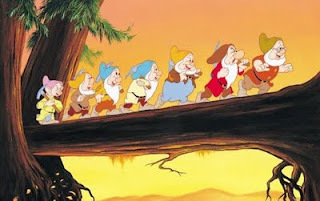 Before Disney homogenized and re-named the seven dwarfs they were, on an archetypal level, what the resourceful daughter (Snow White) had to recognize and transform in herself before going through a re-birth. 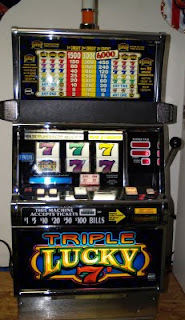 Seven shows up on slot machines and is often associated with luck or chance. In Tarot I find that sevens are the action we take that doesn't have a guaranteed result. We have to rely on our integrity and our sense of what we need to do regardless of outcome. It usually means that whatever we do, inevitably we will be having a learning experience and it will have consequences. the trick is to stay in the game, learn from and take our lumps and keep on keeping on. Sevens aren't safe or predictable. They can be a wrench in the works or the breakthrough that gives us an edge. I find there is a clear relationship between the numeric value of the cards AND the positions of the Celtic Cross spread (which I have my own variation on and will post about...someday). I associate position seven with our immediate actions that will bring about a result from our environment (that result is position eight). Sevens help us to see our hidden motives and they are also where we will run into our blind spots. Superficially sevens are about chance or randomness, but at the same time, how we interact with that chance or randomness. I don't think in terms of luck, rather if I seem to be getting difficult consequences, I have to back up and see where I am blocked or blocking my intent. There is no real learning without this randomness. We would just be following procedure and getting a flat predictable response. There is little growth in that and life would be dull indeed. I remember one of the earliest computer games I ever played was a text adventure called Zork. I played it and played it for about three months and after awhile I thought I had the system licked. I'd found a bunch of the key items and weapons and new the sequence I had to do things in. What kept it challenging, frustrating and fun was a "random thief" that they'd written into the game's code that could show up out of the blue and rob me. Sevens are like that. There is no clear "right choice". There is the action we have to take without guaranteed result. They also have to do with things we don't deserve, like getting mugged or being ripped off, or yelling Bingo. Again, we don't deserve, but can learn from these experiences. 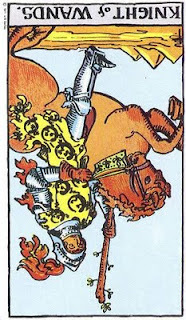 Seven of cups for instance can mean a time of new associations and a mix of characters. For a person looking for a relationship it is tempting to ask "which is the right one?". But that kind of exclusive choice making is dangerous. It's better to treat it like a "come as you are" party where a number of different kinds of people are present, all potentially important in their own way. Let them co-exist, keep your options open and see what emerges. T the very least by being open you'll learn about some different aspects of yourself! 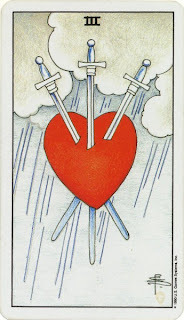 Seven of swords can be sabotage but it can also be where we shoot ourselves in the foot and have to step back from a greater battle where we would have gotten creamed. It can be a sign of double dealing or deceit and people (or sometimes ourselves) having questionable motives. All of the sevens challenge me to look a little more deeply at what I am actually expecting and the integrity of how I have to behave anyway. All of the four suits have to do with the elements in interaction with one another(with the exception of the Aces, which are the awakening of the element). Another example of the head / heart interaction is the eight of cups. A figure is making his way on a tricky landscape, there is no clear road to follow. In the foreground an arrangement of cups is incomplete, there is a gap. Above it all is, what for the longest time I thought was, an oddly shaped moon. I will digress here, for a moment. It just goes to show that you never stop learning with Tarot, it never stops surprising you, if it does stop...put them away for awhile. I have to always be on the lookout for new inflection and possibility. 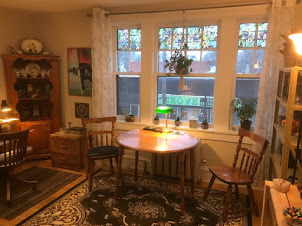 In the case of the eight of cups, I had been working with Tarot for a good 10 or 12 years when one day, while reading cards in a restaurant ( the now defunct Eastside Exchange) one of my co-workers was looking at my cards. His name was Ken and he's a writer, amongst other things. 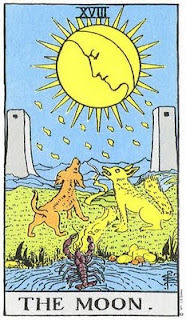 He looked at the eight of cups, HAVING NEVER SEEN IT BEFORE, and said "oh there's an eclipse"! I looked at it, and frankly, I was gobsmacked! Pamela Coleman Smith, the illustrator of the deck, clearly knew how to draw a proper circle. She also knew how to draw a moon and a sun (as they are part of the major arcana). 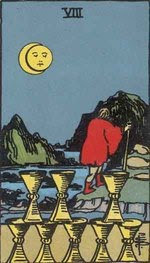 On the eight of cups she didnt simply draw a moon or a sun. It was clear (in that moment- thanks to Ken) that it is a circle over a circle, most certainly an eclipse. This makes even more sense when we consider the association of the moon card with the unconscious, the primal and instinctive and the sun card with the rational, out in the light of day clarity of consciousness, The eight of cups takes on a greater deeper (and I think far more constructive) meaning. If you were having to make a difficult journey on uncertain terrain, in the hopes of finding fulfillment, it would stand to reason that you would want to take a careful, practical approach, just traveling by daylight and watching your step. But true fulfillment isn't something you can plan and schedule. It's not a scheduled enlightenment weekend at Mount Shasta. Nor is uncertainty a bad thing. Fulfillment has to catch us off guard, it has to have an irrational component. Sooner or later in every one's life, there are those rare times, like an eclipse, where it is dark in midday and we have to allow our instincts and urges to also have their say. 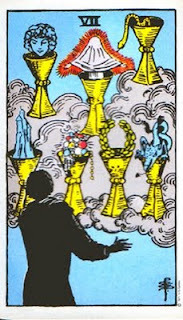 Many traditional interpretations of the eight of cups refer to it as a time of uncertainty, disillusion and confusion. I think it is the uncertainty we HAVE to travel through. It's not the same as confusion where we are wandering around in circles in the same part of the forest saying "didn't I pass that tree three times already?" It is the BLESSED confusion of being outside our usual comfort zone, on unfamiliar ground, allowing ourselves to venture towards what we have not yet experienced. When we know that we can take a certain amount of pressure off of ourselves and use the experience more wisely and deeply. The three of swords always elicits a reaction in a reading. The Rider Waite image, echoed in so many other interpretations is quite dramatic, a heart pierced by swords against a stormy background. 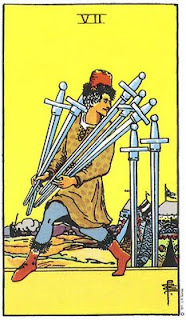 Funny that it is such an emotional looking card, being that it is of the suit of swords, cups are generally the suit that refers to our emotional and compassionate functions. Swords have more to do with our mental or analytical approach to things. How we deal with conflict, protect and articulate. I have found, the more I have worked with the cards that it IS a card of mental function, amidst emotional circumstances. Many resources refer to this as a card of separation and vulnerability. I think of it as a time where we have to look at the interaction of head and heart, both having validity. Sometimes I liken it to a little cartoon, picture an animated heart and an animated brain standing outside a car, figuring out who gets to drive. The heart is very distraught and the head has to intercede. It is at times of emotional distress that the head has to step in, sometimes over-ruling the heart and we have to take sensitive, even painful action that is for the best, like leaving a relationship or acknowledging a hurt. So it makes sense that these times, although emotional, are more of the head, rather than the heart function. I have found though that the card will also come up at times where we have to let the heart back into the driver's seat. We cannot always take a rational approach to relationships. Sometimes after a period of healing, we have to allow ourselves to take risks again and that means being vulnerable. So sometimes the card (depending on other influences) can mean coming out of a time of separation, feeling the sensitivity of healing. Just like the pain of a numbed limb coming back to life again, the three of swords says "if you can feel it, you can heal it".